Yellow watermelon not only exists, but is delicious. The Jen Bokoff is not only a drink, but it is delicious. We are very creative with subject lines; we’ve only repeated ourselves a handful of times. Sometime Someday Somewhere was a good one, as was the more recent Sporific Sundays is a fun one; too bad it’s Tuesday. Trends include alliteration and musings. Wednesdays are highlights, with lines such as Wednesday is for Weeping Wimpy Witches and Whoopsie Wednesday. Soccer matchups are also popular. Sam deserves most creative credit. Adam Schafer has the best house ever, including lots of Eames chairs. The golden ratio isn’t actually magical; it’s the most often mentioned and most often incorrectly mentioned mathematical thing in the world. A Math Bagel?! More favorite things! It’s explained a bit here, but take some time to play with the image here. My phone number first appears at the 2,816,009th decimal digit of pi and never appears again! What about yours? Still playing Chutes and Ladders with the kids? Are you losing or feeling bored? Let math help you climb that ladder of enjoyment! DataGenetics gives a fascinating mathematical breakdown of Chutes and Ladders. 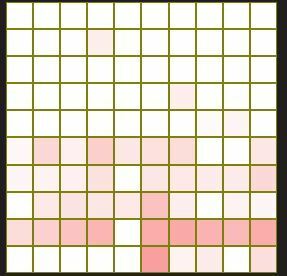 Learn what squares are most likely to land on, how many rolls will complete a game, and what would happen if you added more ladders. Maybe it’s time for you host a game night with your buddies and throw this one back into the mix. DataGenetics has other very cool board game analyses and more. Check it out. Remarkably, everything above holds true if you square each term. From the same people who brought you this mind-melter.